Welcome to a Run thru the Woods, the most fun you can have in the woods! This run happens on Black Friday offering you the good sense to opt outside instead of stampeding for material possessions that get outdated and out of fashion as quickly as you purchase them. Seriously, you’ll remember this whacky awesome trail run more fondly ten years from now rather than you will remember the hundreds of people with you that were pressing their noses to the glass store doors on an early morning of shopping in hopes of getting a bargain on another wide screen tv. Material goods are just stuff, running is eternal…especially, when its a run thru the woods! This race offers three distances to choose from, – 5k, 10k, 15k. The location of the race is at the beautiful Whitemarsh Island Preserve. The beneficiary of this run is you and, Sega Sorba. As with all Run 4 a Reason races, no drinking cups or bottled water is provided! Bring your own cup or hydration system! -6:45 am: main gate to preserve opened. There are two courses for this race but only the 15k runners will experience the second course. 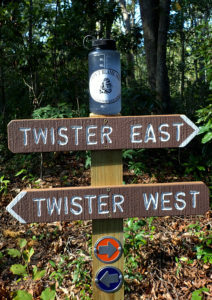 The 5k and 10k runners will run what’s called Twister East (one time for the 5k and two times for the 10k runners). 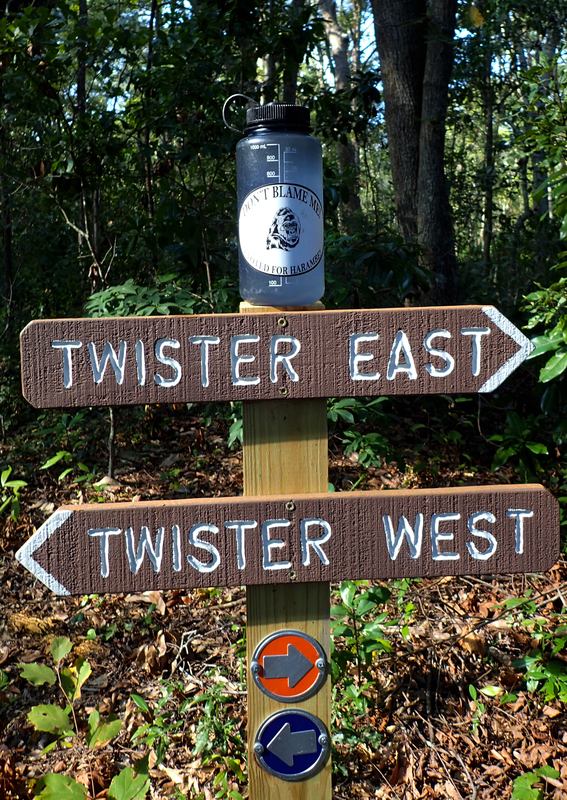 For the third lap the 15k runners will run Twister west. We will have a volunteer stationed at this junction to remind runners which course to take. Twister east (3.16 miles) is slightly longer than west (3.11 miles) but not by much. Both trails are windind and fun. 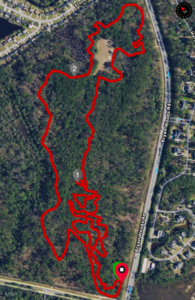 The whitemarsh trails are the best trails in all Savannah. As with any real trail race, expect some roots and quick turns. The course is almost entirely flat and fast. Just keep your eyes open and lead with your feet. 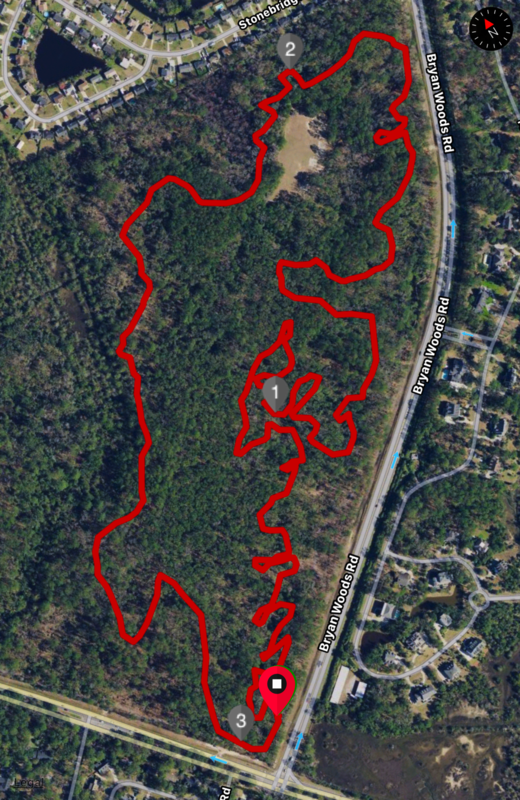 These are very fun trails to run! We will have surveyor flags marking the course along with arrows. Keep the flags to your right and you will not get lost! We over-mark the course with flags to make it very difficult for you to get lost. Stick to the course and you’ll be golden. The main entrance gate to Whitemarsh Preserve (on Johnny Mercer Blvd, just north of the Bryan Woods and Johnny Mercer blvd intersection) will not be open. 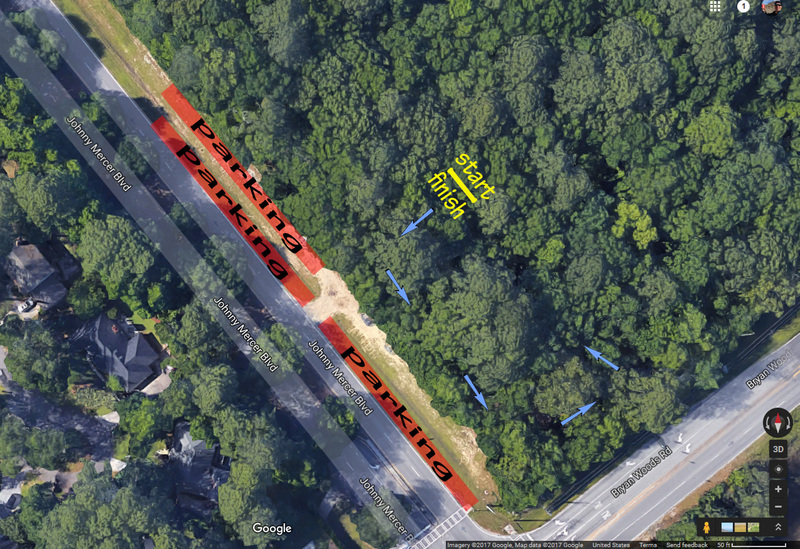 Parking will be alongside Johnny Mercer…please refer to the map below for the parking. 1 portable toilet will be located at the main entrance of the preserve. Please note: if you drop down to a lower distance on race day than what you registered for, you will get a dnf on your ultrasignup standings. We will give out prizes for the top 3 male and female of each race (5k, 10k, 15k). There is a DFL award for the 10k and 15k. We hope you enjoy the awards. All are handmade and unique and…bizarre. Please do not hesitate to contact me should you have any questions regarding the race! I wholeheartedly thank you for participating and supporting this trail race! It is truly my favorite race and I’m a bit sad that its going away but its all good…let’s have fun Sunday! 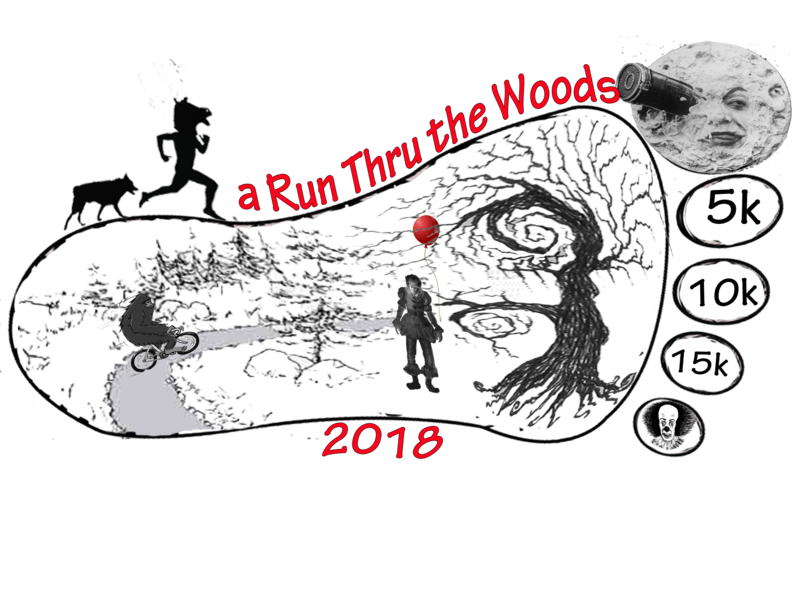 My goal for this race is as it has been for the past two years and that is that you may have a wonderful and unique experience running the beautiful trails at the Whitemarsh Preserve! We will be making a small donation to Sega Sorba after this race on behalf of all the Savannah trail runners as we would not have these beautiful trails if it wasn’t for this group! The Sega Sorba guys and gals are always out at the Whitemarsh Preserve, Priests Landing and Tom Tripplett working on the trails and maintaining them and they do this as volunteers!